For sale, Baby shoes, Never worn. The extreme terseness in this elliptical tragedy has made it a favorite example of writing teachers over the past several decades, a display of the power of literary compression in which, writes a querent to the site Quote Investigator, "the reader must cooperate in the construction of the larger narrative that is obliquely limned by these words." Supposedly composed sometime in the '20s at The Algonquin (or perhaps Luchow's, depending on whom you ask), the six-word story, it's said, came from a ten-dollar bet Hemingway made at a lunch with some other writers that he could write a novel in six words. After penning the famous line on a napkin, he passed it around the table, and collected his winnings. That's the popular lore, anyway. But the truth is much less colorful. There was an ad in the Brooklyn “Home Talk” which read, “Baby carriage for sale, never used.” Would that make a wonderful plot for the movies? Many more examples of the narrative device abound, including a 1927 comic strip describing a seven-word version—“For Sale, A Baby Carriage; Never Used!”—as “the greatest short story in the world.” The more that Haglund and Quote Investigator’s Garson O’Toole looked into the matter, the harder they found it to “believe that Hemingway had anything to do with the tale." It is possible Hemingway, wittingly or not, stole the story from the classifieds or elsewhere. He was a newspaperman after all, perhaps guaranteed to have come into contact with some version of it. But there’s no evidence that he wrote or talked about the six-word story, or that the lunch bet at The Algonquin ever took place. Instead, it appears that a literary agent, Peter Miller, made up the story whole cloth in 1974 and later published it in his 1991 book, Get Published! Get Produced! : A Literary Agent’s Tips on How to Sell Your Writing. The legend of the bet and the six-word story grew: Arthur C. Clarke repeated it in a 1998 Reader's Digest essay, and Miller mentioned it again in a 2006 book. 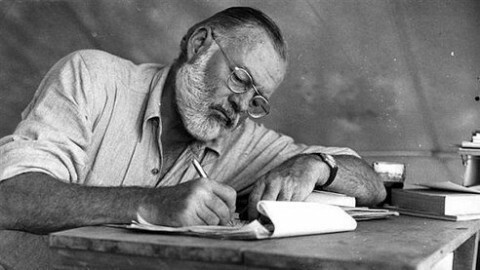 Meanwhile, suspicions arose, and the final debunking occurred in a 2012 scholarly article in The Journal of Popular Culture by Frederick A. Wright, who concluded that no evidence links the six-word story to Hemingway. So should we blame Miller for ostensibly creating an urban legend, or thank him for giving competitive minimalists something to beat, and inspiring the entire genre of the “six-word memoir”? That depends, I suppose, on what you think of competitive minimalists and six-word memoirs. Perhaps the moral of the story, fitting in the Twitter age, is that the great man theory of authorship so often gets it wrong; the most memorable stories and ideas can arise spontaneously, anonymously, from anywhere. I think your use of the word “picaresque” is wrong. Sounds like a Strindberg short story, which isn’t exactly six words long, but bretty short too: about a page. Someone seems to have summarized it. “…inspiring the entire genre of the ‘six-word memoir’…” Not to mention this active little expression of it…. Everyone (more or less) writes their own, ad hoc. Lots of SMH contributions but some really outstanding ones too. The man was terse. He wrote short sentences. It is a story about the man who wrote the shortest story. The man would not be Henry James. Henry James would not write the short sentence, the short story. Henry James stories are like stories by a German. Ernest Hemingway went to Italy. He went to Paris and he went to Spain. He went to Cuba. He bought a phrase book and the sentences in the phrase book were short and he saw that the short sentences in the phrase book were good, because you said what you needed to say and nothing more. And it was good that the sentences were short because you would have to say them several times before the people understood what you wanted. I thought the story was about the cot for the baby but it could be any of the things that you have with a baby. It is not the same, because you don’t put a baby in shoes straight away. I could tell you that story, but it’s no fun, so I won’t. It’s not even a story. That is a very bad example of Twitterture. End of. This guy is astounding. Amazing. All nice exposition and supposition going nowhere. Try living it. That succinct enough for you? Exactly. The story may have been going around, but Hemingway told it right. ts actually kinda simple but i can see how you didn’t get it. For sale:being sold baby shoes:baby shoes never worn: a baby has never worn these shoes. Parents were expecting a baby so they bought baby shoes but they had a miscarriage so they had to sell them. It’s not even a story. The basis of a story HAS to HAVE a beginning, middle, and end. Statements are NOT stories by definition and the factual properties that make up a story. It is FACTUALLY a statement and not a story. A story TELLS a story and isn’t open to INTERPRETATION.